We can offer Newly refurnished, bright and fresh rooms with a mix of the old and the new! 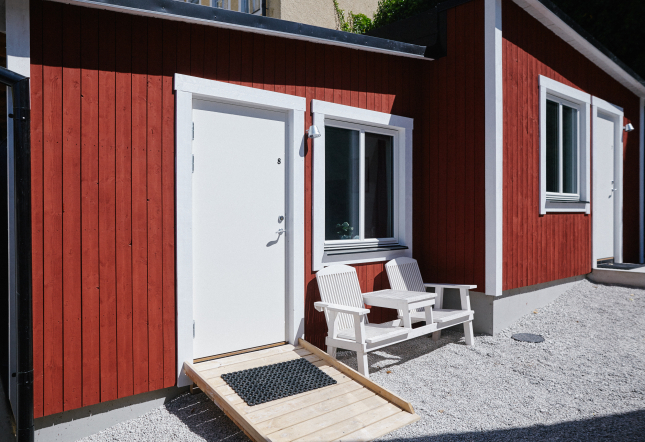 All rooms at Visby Accommodation & Hostel has a wardrobe and chairs and tables. Some rooms have shared bathrooms, while others have private bathrooms and kitchenettes. We have different sizes and types of rooms, ranging from single to six-bed rooms. Double Room Room on the first floor overlooking Hästgatan. Triple Room Our only triple room on the first plane with three separate beds with a concrete desk. Family room Our second family identical to room 3 on the second floor with views in Waller’s place. Double room Small Double Room with site-built loft bed overlooking our lovely garden. Double room This room is our room on the second floor with a private balcony with sea views. The room also has two chairs and a table. Triple room Bright room on the second floor overlooking S:t hansgatan. Double Room This cozy room on the third floor with views of the sea from the bed! Triple Room Our second triple rooms on the third floor overlooking the rooftops of Visby.